Catch up on your state trivia with these Colorado history firsts and interesting fun facts about the state. 600 AD - Mesa Verde features an elaborate four-story city carved in the cliffs by the Ancestral Pueblo people between 600 and 1300 A.D. The mystery surrounding this ancient cultural landmark is the sudden disappearance of the thousands of inhabitants who created the more than 4,000 identified structures. 1806 - Lieutenant Zebulon Montgomery Pike explored the southwest portion of the Louisiana Territory and though he never climbed the peak that bears his name, he did publish a report that attracted a lot of interest to the area. 1858 - A party of prospectors led by William Green Russell discovered gold in what is now downtown Denver. 1858 - Colorado's first and oldest military post, Fort Garland was established in 1858 and commanded by the legendary frontiersman Kit Carson. 1859 - John Gregory discovered "The Gregory Lode" in a gulch near Central City. Within two weeks, the gold rush was on and within two months the population grew to 10,000 people in search of their fortune. It came to be known as "The Richest Square Mile on Earth". 1869 - The World's First Rodeo was held on July 4th, 1869 in Deer Trail. 1881 - Aquamarine (state's official gemstone) was first discovered in 1881 on Mt. Antero by Nelson Wanamaker. Mt Antero is the highest known gemstone-collecting site in North America and still yields gem quality aquamarine one hundred years after that amazing first discovery. 1881 - The Durango and Silverton Narrow Gauge Railroad has been in continuous operation since 1881 and has appeared in more than a dozen movies including How the West Was Won (1963) and Butch Cassidy and the Sundance Kid (1969). 1867 - Built by Seth Lake, the Astor House in Golden was the first stone hotel built west of the Mississippi River. 1887 - John Henry "Doc" Holliday's brief and tumultuous existence led him to Glenwood Springs where he succumbed to tuberculosis and died at the Hotel Glenwood on November 8, 1887. 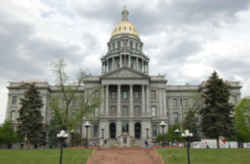 1894 - "Beulah red" is the name of the red marble that gives the Colorado State Capitol its distinctive splendor. Cutting, polishing, and installing the marble in the Capitol took six years, from 1894 to 1900. All of the "Beulah red" marble in the world went into the Capitol. It cannot be replaced, at any price. 1905 - The Kit Carson County Carousel in Burlington dates back to 1905, making it the oldest wooden merry-go-round in the United States. It is the only wooden carousel in America still with its original paint. 1935 - Denver, lays claim to the invention of the cheeseburger. The trademark for the name Cheeseburger was awarded in 1935 to Louis Ballast. 1945 - In Fruita, the town folk celebrate 'Mike the Headless Chicken Day'. Seems that a farmer named L.A. Olsen cut off Mike's head on September 10, 1945 in anticipation of a chicken dinner - and Mike lived for another 4 years without a head. 1976 - Colorado is the only state in history, to turn down the Olympics. In 1976 the Winter Olympics were planned to be held in Denver. 62% of all state Voters choose at almost the last minute not to host the Olympics, because of the cost, pollution and population boom it would have on the State Of Colorado, and the City of Denver. Great Sand Dunes National Monument, near Alamosa, contains some of the largest and highest sand dunes in North America. Colorado earns its nickname "Mother of Rivers" because more major rivers have their source in Colorado than in any other state. The largest of the hundreds of natural lakes in Colorado is Grand Lake, which is almost one full square mile! There are also nearly 2000 larger man-made lakes in Colorado. Leadville is the highest incorporated city in the United States at 10,430 feet elevation. 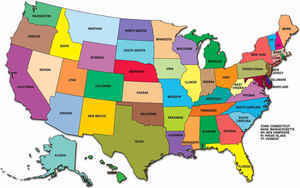 With an average elevation of about 2070 m (6800 ft), Colorado is the highest of all the states. Millions of pronghorn and bison roamed the high plains of Colorado before the species were hunted nearly to extinction. The Grand Mesa is a large mesa in western Colorado in the United States. It is the largest flat-topped mountain in the entire world. It has an area of about 500 square miles (1,300 km2) and stretches for about 40 miles (64 km) east of Grand Junction between the Colorado River and the Gunnison River, its tributary to the south. The north side of the mesa is drained largely by Plateau Creek, a smaller tributary of the Colorado. The west side is drained largely by Kannah Creek, which is received to the west by the lower Gunnison River. The mesa rises about 6,000 feet (1,800 m) above the surrounding river valleys, including the Grand Valley to the west, reaching an elevation of about 11,000 feet (3,400 m), with a maximum elevation of 11,333 feet (3,454 m) at Crater Peak. 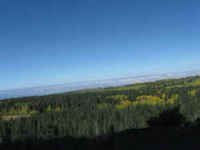 The Grand Mesa is flat in some areas, but quite rugged in others. The LoDo region of Denver stands for Lower Downtown. Colorado means "colored red" and is known as the "Centennial State." The Durango & Silverton Narrow Gauge Railroad continues to provide year round train service operating a historical train with rolling stock indigenous to the line. The line was constructed primarily to haul mine ores, both gold and silver, from the San Juan Mountains. Colorado contains 75% of the land area of the US with an altitude over 10,000 feet. Colorado has 222 state wildlife areas. Leadville is the highest incorporated city in the United States at 10,430 feet elevation. Because there was lots of "silver" named towns at the time, the founding fathers suggested Leadville. Fountain, has the distinction of being the United States' millennium city because it best symbolizes the overall composition of America. Fountain is the most accurate representation of the American "melting pot." Fountain was chosen after a Queens College sociologist crunched Census Bureau statistics in an effort to find the one city in the country that best represented the population make-up of the United States. Pueblo is the only city in America with four living recipients of the Medal of Honor. The tallest building in Colorado is the Republic Plaza at 57 stories high, in Denver. Every year Denver host the worlds largest Rodeo, the Western Stock show. Dove Creek is the "Pinto Bean" capital of the world. The tallest sand dune in America is in Great Sand Dunes National Monument outside of Alamosa. This bizarre 46,000-acre landscape of 700-foot sand peaks was the creation of ocean waters and wind more than one million years ago. The slogan of "Pikes Peak or Bust," painted across many of the prairie schooners, was born at a time as fortune hunters headed west. Although only a handful of those who flocked to the region ever found gold. At 14,110 feet above sea level over 400,000 people ascend Pikes Peak each year. The aptly named town of Twin Lakes lays adjacent two natural lakes at the foot of Colorado's highest Fourteener, Mt. Elbert. The Colorado Rockies are part of the North American Cordillera, which stretches 3,000 miles from Alaska, through western Canada and the United States, into northern Mexico. The centerpieces of this dramatic uplift are the peaks over 14,000 feet, or "Fourteeners", as they are affectionately referred to by climbers. There are 52 Fourteeners in Colorado. Rocky Ford has been dubbed the "melon capital of the world." The Yampa River below the northwest town of Craig holds northern pike in the 20-pound range, while the Roaring Fork and Frying Pan rivers are prime spots for trout fishing. The world's largest natural hot springs pool located in Glenwood Springs. The two-block long pool is across the street from the historic Hotel Colorado, a favorite stop of former president Teddy Roosevelt. Colorado's southwest corner borders Arizona, New Mexico and Utah. Only place in America where the corners of four states meet. There are nearly 20 rivers whose headwaters begin in Colorado, with the Continental Divide directing each river's course. The Colorado Rockies play at the 50,000 seat Coors Field, located in downtown Denver. Abundant nesting and migrating birds and other native animals provide a "world-class" watchable wildlife experience. Bald eagles and other raptors, sandhill cranes, shore birds and water birds can be seen seasonally at San Luis Lakes near Alamosa. Florissant Fossil Beds National Monument near Cripple Creek is a lesson in history set in the one-time shadow of the Guffey Volcano. The volcano erupted millions of years ago, creating fossils and leaving the valley filled with petrified trees.